This date was perfect. As I let my eyes roam over his beautifully lined and whiskered face, warmth radiated in the depths of my stomach despite our chilly rendezvous location. His size made me feel tiny but in no way vulnerable. Even his scars weren’t awarded due to his own aggression. I was interesting to him and his genuine curiosity is what made this meeting so unique. Gentle, observant and intelligent; I felt calm yet exhilarated in his presence. We respected each other from the start and within minutes I had fallen in love with a merman………a manatee. I was even able to forgive his unfortunate flatulence when he rolled over onto his back and presented his blubbery belly to be stroked! You don’t need to join a dating site to find your sea cow soul mate. 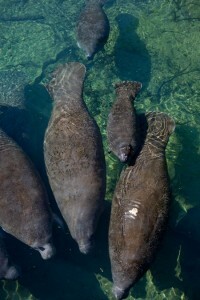 Crystal River is the epicentre of Florida’s Nature Coast and is ‘Home of the Manatee’. 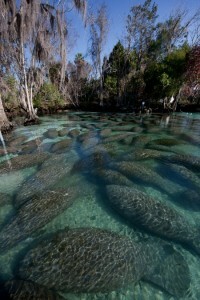 What makes this area so special are the warm springs that keep the water temperature 22°C (72°F) year round; perfect for the Florida manatees who lose body heat easily in cold water. So, in the winter when the Gulf of Mexico cools, the mammoth marine mammals gather at the fresh water outflows. The Crystal River Wildlife Refuge is the best place to see them where you can kayak and snorkel with them or simply view them from bridges, docks and even guesthouse gardens! At peak times during the winter (mid-December to the end of March), this aggregation can reach up to 400 individuals so you’re guaranteed a sighting. 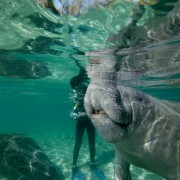 In fact, Crystal River as an ecotourism destination is perhaps too popular. Every year 200,000 people visit the area to see the manatees and problems arise when the visitors aren’t educated in how to respect these creatures. We must remember that we are entering THEIR environment and they aren’t there for us to play with unless we are invited. The U.S. Fish and Wildlife Service provides extensive educational material as to how to interact with the animals. 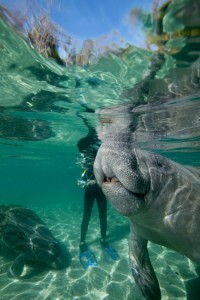 However, some tourists will still harass the manatees when they are resting. This uses up vital calories that should be conserved so the beasts don’t succumb to hypothermia in the winter months. This is ecotourism at its worst. Unlike other destinations, Crystal River doesn’t need more visitors…..just the right sort. Crystal River is a short drive from Tampa or Orlando (less than 2 hours) and there are a range of hotels, lodges and B&Bs to choose from (The Plantation Inn is probably the best in the area). To avoid the crowds and have a more intimate experience with the manatees, try to get out early on weekdays (weekends are especially busy). Bird’s Underwater is a highly recommended tour provider and if you’re in any doubt as to how you should interact with the aggregation, visit the local U.S. Fish and Wildlife Service centre for further information. As well as manatees, the area is excellent for bird watching and you can see bald eagles, ospreys and anhingas. If you’d like to see even more wildlife while visiting Florida, the Everglades National Park is about a 5 hour drive away and you can take Airboat tours to see the American Alligators basking in the sun. Oh, and if you’re after a great breakfast whilst in Crystal River, look no further than AJ’s Cafe. Quite an experience!